In case you still haven’t known by now, WikiLeaks began publishing on Friday The Saudi Cables: More than half a million cables and other documents from the Saudi Foreign Ministry that contain secret communications from various Saudi Embassies around the world. This post is the third of a series of leaks I found worth sharing here on the blog. So, what do we know by now? 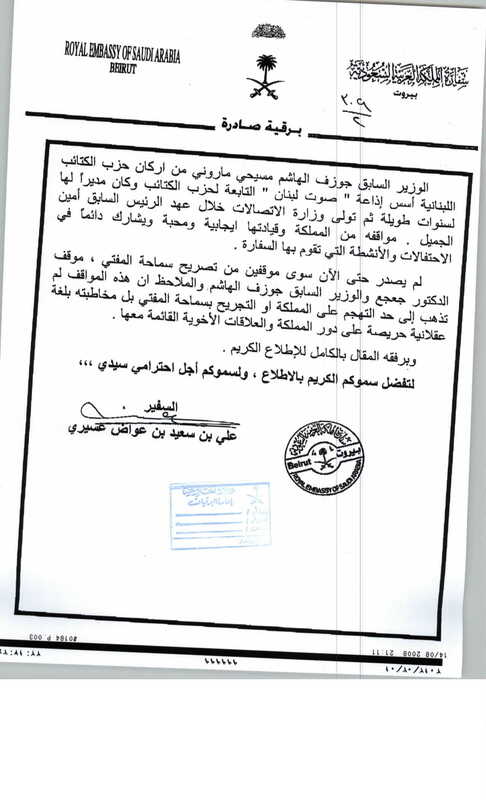 We know that, according to the cables (and among other minor things), the Saudis asked for the release of members from Fatah Al-Islam, that the Saudi Government paid MTV (doc83763), that MP Boutros Harb requested money from Saudi Arabia in order to create a political party (doc32628), and that the Lebanese Forces asked for funding from Saudi Arabia. Yesterday there was a huge debate on whether some of the cables are legit or no (since a number of them share a same code on the upper left). It could be photoshopped, or it could be for filing purposes. We’re a free democratic independent country so you can make what you want of it (I wisely suggest, like I said yesterday, that you all stick to the propaganda of your parties because you’ll feel safe, warm and cosy). The only purpose here is to find anything interesting related to Lebanon among the Saudi cables and put it on the blog. Anyway, here are some new/other cables that are worthy of sharing. 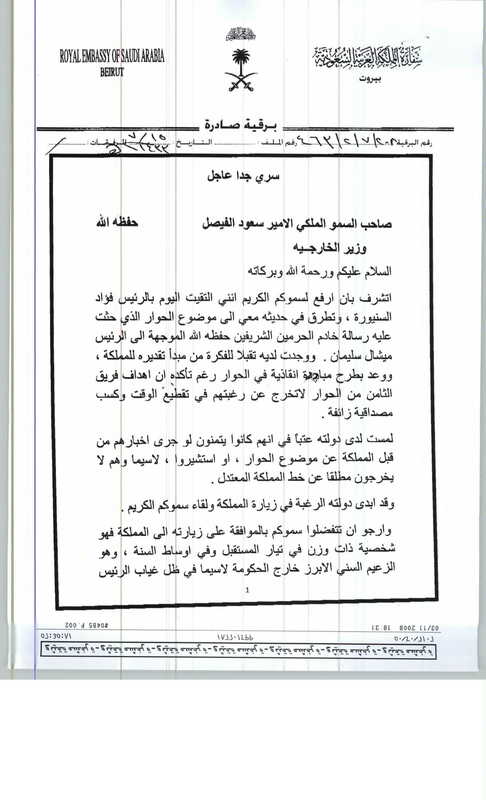 According to them, the CIA infiltrated Hezbollah via Ali Bazzi of Amal, there’s a plan (around 2012) to pressure Sleiman into becoming more M14-ish, the Kataeb, Geagea and Siniora are praised, and the Saudi Foreign Minister said that he wanted Hariri’s Saudi critics to be censored. According to this cable, Siniora wanted to travel to Saudi Arabia and meet the King, and the ambassador roots for him saying that he is the most important Sunni politician outside the cabinet, especially that (a Prime Minister, most likely) Hariri is absent. This cable discusses how Michel Sleiman is going to convince M8 and M14 to attend the dialogue he’s hosting. The importance of this document is towards the end, where the Cable mentions that there might be a plan to pressure the President to side “with the right coalition” and that he’ll be invited to visit the Kingdom if things work out. And last but not least, according to this cable (It’s a word file), Hariri gave the ambassador some articles in Saudi media criticizing him and the Saudi foreign minister subsequently asked for censoring the writers of those articles. Yay for freedom of speech? إلحاقاً لبرقيتي رقم 92/16/61393وتاريخ 25/2/1432هـ التي تشرفت برفعها للمقام الكريم بشأن مقابلة سفير المقام السامي في بيروت لفخامة رئيس الجمهورية اللبنانية ميشال سليمان . أفادت سفارة المقام السامي في بيروت بأن سعادة السفير تسلم من دولة الرئيس سعد الحريري خلال الزيارة التي قام بها لدولته نسخ من مقالات لكتاب سعوديين ولآخرين نشرتها بعض الصحف السعودية تناولت بصورة سلبية دولته وتيار المستقبل وضد المحكمة الدولية (مرفقة طيه) ، وقد عبر للسفير عن إستيائه خاصة وأنها نشرت في أوج الأزمة الحالية إضافة الى ما يتعرض له من حملات في وسائل إعلام (8) آذار التي أبرزت تلك المقالات خاصة تلفزيون المنار وإذاعة النور التابعة لحزب الله . أشارت السفارة أنه بالنظر الى بعض تلك المقالات لكتاب بارزين كعبدالرحمن الراشد (صحيفة الشرق الأوسط) وداوود الشريان (صحيفة الحياة) فقد فسرها البعض على أنها تعبر عن وجهة نظر في المملكة تنتقد أداء سعد الحريري وتدعوا إلى التخلي عنه ، وقد لاحظت بعد استقالة حكومة الرئيس سعد الحريري صدور مقالات كثيرة تنتقد تيار المستقبل والرئيس سعد الحريري ، وبعضها ينتقد التزام المملكة بلبنان، وبنت وسائل إعلام حزب الله وحلفائه على تلك المقالات استنتاجات بأن المملكة لم تعد ترعى الرئيس الحريري وتوجهاته حول معالجة الأوضاع في لبنان، وأن هناك فريقين سعوديين أحدهما يرغب بالتعاون مع سوريا والآخر متأثر بوجهات النظر الأمريكية ، وهذا هو أحد الأسباب التي أدت إلى تأخر ظهور موقف سعودي واضح مما يجري ، نتج عنه ارتباك داخل الصف السني نتيجة لتلك الآراء والتي قد يكون لها انعكاسات سلبية على وحدة صفه وهذا بطبيعة الحال ما تأمله قوى (8) آذار. ترى السفارة أنه قد يكون من المناسب وقف مثل هذه الكتابات التي لاتخدم الأهداف المنشودة للمملكة. Simply fake documents… the Photoshop effects are very clear! “The only purpose here is to find anything interesting related to Lebanon among the Saudi cables and put it on the blog”. I was very clear that you are free to believe what you want to believe.